This is my first book written by a comedian this year :) Took me awhile. I think I've been powering through most of the popular memoir/commentaries over the last couple of years. I've got a Nick Offerman title on my wish list, so don't be surprised if you see another review in the not too distant future. Modern Romance was a little different than your run-of-the-mill celebrity book. It had very little to do with author Aziz Ansari personally, which was both refreshing and disappointing all at the same time. Instead, it was a commentary on the state of contemporary romance, the frustrations and successes of internet dating, and the struggles of connecting with another human being. There was also a LOT of conversation about food. Apparently Ansari is always hungry. And while I was relatively impressed with his research on the topic, decent in scope and purpose with a well-timed explanation that the information provided is not meant to be exhaustive, it's not really what I wanted from him. I chose the book because it was written by a comedian I adore from Parks & Recreation. And while it is very clearly written in his "voice", I missed the personal stories and anecdotes that I came to love in Bossypants, Yes, Please, and Is Everyone Hanging Out Without Me? 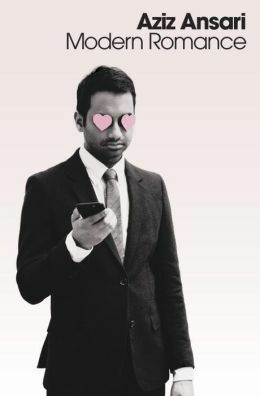 In the end, I didn't really want to hear about "modern romance" from Aziz Ansari. His commentary was sprinkled throughout, but next to the "scientific" findings of the interviews and forums he conducted, it sometimes just seemed off or overly...harsh? crude? (I mean, it was crude at times, but that did surprise or offend me per say) just didn't fit? I guess that's it. In the end it just didn't seem to fit. Perhaps I just wanted something different. Not sure. Not that it wasn't worth the read (especially the audiobook. Definitely wouldn't have been the same without his voice in my ear), but maybe I've just been listening to too many other similar titles of late. If you like Ansari, listen. If you don't, maybe pick up Bossypants. If you're interested in why internet dating works for some and not others, give it a listen. It's not a guide book by any means, but it does have some heart and quite a bit of hope.